There is no doubt that times change. We’ve admitted on several occasions that we’re a little biased towards things in the past. Now, please understand that even as we ‘age’ we still understand that the future is always going to be about change. It’s the natural order of things. However, when it comes to the medium of radio, we’ve seen a LOT of changes over the years. Consider that in the 1960’s, AM radio was the ONLY radio. Your choices were AM Radio, 45 rpm singles and 33 1/3 rpm albums…some still remember 78 rpm albums as well. Reel to reel tape decks were only for the wealthiest of music enthusiasts. AM Radio. . .when DJ’s ruled the airwaves and a singer or group could make it or break it depending on a DJ’s decision. Many were the artists that camped out at radio station studios for the ‘chance’ to get on the air. Depending on where you lived, you could pick up an AM station from miles away. . .say, living in the Chicago area and picking up KMOX out of St. Louis–and those Cardinals broadcasts! How many can remember listening for the chance to call in to win tickets to this concert or that. . .a chance to go back stage or be picked up and chauffeured to the show? The 70’s brought about the advent of ‘album rock’ and on the FM side of the dial, there was more music with fewer interruptions–mainly because so few people had FM radios–and less ‘personality’ than their AM brethren. Some of the most remembered music of that generation was played on FM–Steely Dan, The Eagles, The Rolling Stones. . .and so many others that had followings found their fan base growing because of repetitive play on FM. Added to the mix during this time was the wildly popular–but short-lived–eight track tapes followed closely by cassette tapes. As FM grew in popularity, AM’s stronghold on the listening audience waned–significantly. FM Radio would go on to dominate listener appeal. . .until Compact Discs arrived. Suddenly, that crisp, studio quality sound was available in home and automotive audio. Something that was originally reserved for only the wealthiest of listening affecionados was now available to anyone that wanted it. An amazing transformation that has continued to evolve to this day. 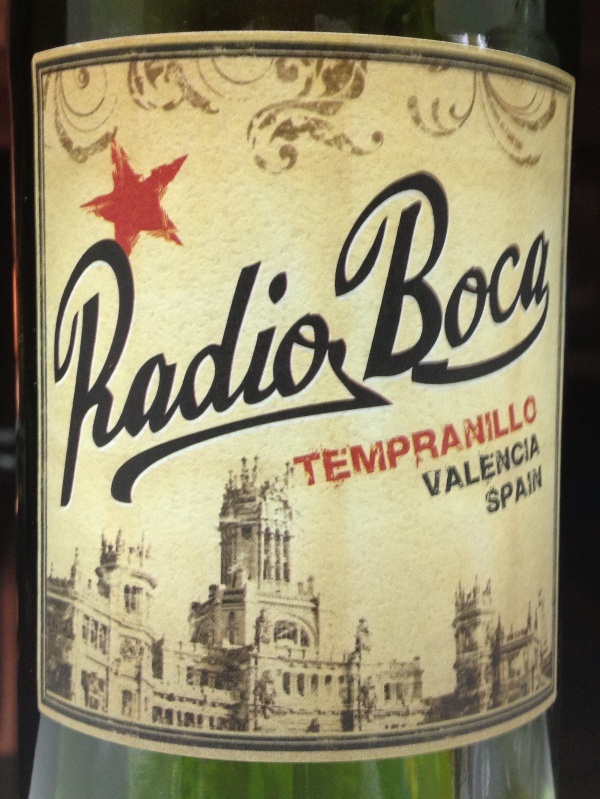 Tonight we opened a 2011 Radio Boca Tempranillo from Valencia Spain. This is a young fruity wine; it’s a medium-body but has nice color and a wonderful nose upon opening. Priced at less than $11 a bottle, we were surprised by the taste, the structure and complexity of the wine. As fans of tempranillo, we thought that as young as it is, we probably weren’t going to get a lot of the fruitiness, but instead were extremely impressed with what we tasted. There is an earthiness to the wine as well, it’s something you’d expect from a well vinted Spanish wine. Clearly, this wine isn’t going to wind up in cellars for the next 50 years, but it is going to make a great Sunday afternoon even better! We served ours with grilled Portobello mushrooms and sautéed vegetables, and it was a great combination. We picked this little wine up at World Market in Bryan – while a light wine – we’d more than likely pick up another bottle at the sale price of under $10 . . . probably wouldn’t pay much more than that. With iPods, iPads, iPhones, Smartphones, MP3 players, Sirius/XM Satellite radio and SO MANY other choices available for music, we harken back to the days of AM Radio and the beginnings of FM Radio. Sometimes, you can have too many choices. . .leaving you without a clear preference . . .and the choices may not be what you really want. We remember–going to SFA in Nacogdoches–Nocturne 92.1 FM–the mellow sound in a college town!! Wow, that’s WAY too much information! Here’s to a new week – Please remember to enjoy your favorite wine responsibly and recycle whenever possible. Categories: Uncategorized | Tags: Radio Boca Wine, Tempranillo, Valencia Spain, World Market | Permalink.